Congratulations Kamine and Torsam! We had struggled to find the perfect wedding date due to family members flying in from out of the country but everything came together and the wedding couldn't have been more perfect. Their ceremony was held outside at the beautiful Marriott Waterside downtown. Kamine wanted to incorporate red roses for her ceremony and wanted something different. We came up with a crystal and rose curtain backdrop which looked great in the photos thanks to Chi photography. 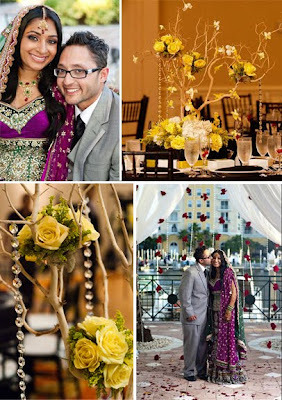 White manzanita branches, floral clusters, swarovski crystals and orchids adorned the tables. Amber lighting washed the walls and chiavari chairs finished the look. 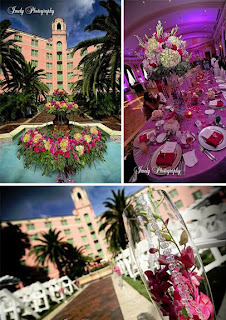 Above are photos of a celebrity wedding we had great pleasure of being a part of at the Renaissance Vinoy Resort back in August of last year. The bride was very particular with her colors. She chose American Beauty, which is a deep fuschia color. We complimented the color of her choice with beautiful shades of purple and lightened the piece using green antique hydrangeas which turned out absolutely stunning. Beautiful linens graced the tables, silver chargers, menu cards and the icing....lots of bling!! We hung several strands of swarovski crystals in each centerpiece. Our designer containers glowed in a beautiful purple hue. The room looked perfect! Crystals were integrated into the beautiful fountain piece we designed for the ceremony. We had several hotel guests and Vinoy staff take photos of the ceremony decor prior to the wedding. What a great compliment!